You can now block new member sign-ups based on their email domain. This is useful if you want to only allow sign-ups with company email addresses. Automatically block sign-ups that use free email providers such as yahoo, hotmail, and gmail. Over 3,000 domains are included. 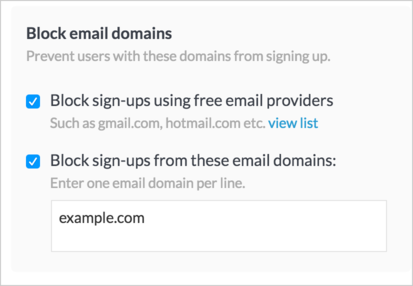 Block sign-ups based on email domains that you specify. Enable this feature in Admin > Settings > Moderation. Note that this only applies to new sign-ups. Existing members will not be affected by this setting. 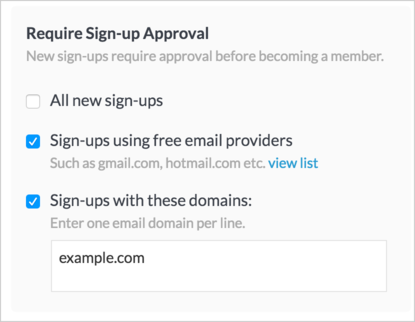 As an alternative to blocking, you can review and approve sign-ups by email domain. When a user signs up with a specified email domain, moderators can review and approve or deny their request. Require moderator approval of sign-ups using free email providers. Require moderator approval of sign-ups using domains that you specify. All of a sudden, a user was able to register for my community using a GMAIL account. I don't understand how that is possible as I've blocked sign-ups from "free" email providers using this new functionality. When I clicked on "View List" I noticed that there are underscores ('_') in the provider domains and not periods (','). Could this be the problem or do you suspect it is something else? Hi Neil , the block signup feature will only block new users from signing up. If a user already has an account, it doesn't prevent them from changing their email to gmail, which is likely what happened in this case.